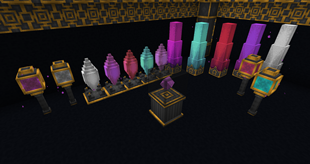 Fancy Lamps is a forge-based, multiplayer-compatible continuation of the Arcane Lamps mod by cesar_zorak, adding several light sources and decorative blocks to your game, perfect for all of your decorative needs. 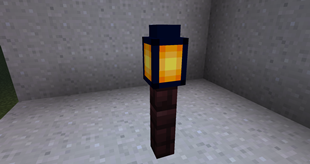 A series of lamps and other blocks with styles based on Thaumcraft, with lamps of 3 different heights in 5 thematic colour variations and some supporting decorative pieces. 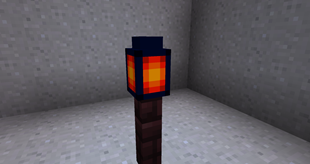 Two lanterns based on the blocks in 1.14 vanilla, one a glorified torch and the other a light-up redstone block. Connected Textures Mod support - fancy up your world even more! Fancy Item Models - Bored of static, 2d items? Try the Crystalline Ender Gem for all of your animated 3D item needs! Animated Textures - Bringing even more life to your lamps, with a crimson-tainted obelisk that almost seems to breathe or a Rainbow Arcane Gem which flashes every colour of the rainbow*. Powerful Feng Shui - I don't know what this is but my Chinese friend says it's important, so you can have some of that. *Rainbow Arcane Gem may not flash every colour of the rainbow.